Is it possible for a camera system to provide better comfort, safety and efficiency in everyday life? At Elotec, we believe it is. Elocam allows you to easily monitor children's playtime, high risk tasks, animal births etc. The system consists of an advanced wireless monitor/receiver unit that can display video from up to four wireless cameras. Both the monitor and the cameras can be easily moved as needed, around permanent Extender devices that ensure a long reach for the system. During periods of animal births, you will often have to walk to the barn or stable to check in on the situation. 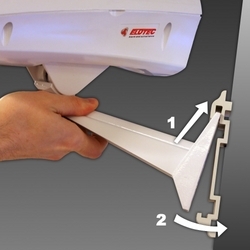 With an Elocam system, you can remain at ease until the system lets you know that something is happening. If you suffer an accident working alone in the feed silo or with a log splitter – how long will it take for someone to notice that you need help? With Elocam, other family members or staff can keep an eye on you and quickly discover that you are in trouble. Do you often have to interrupt ongoing tasks to check on conditions elsewhere on the farm? With Elocam, you can always have an overview of important areas – no matter where you are. The wireless cameras provide high quality color images even in low light conditions. Sound is essential to evaluate the situation, and the cameras are naturally equipped with microphones. So that you are not needlessly disturbed, Elotec has developed the SmartMute function, which ensures that sound is only activated when something is going on. New functions are continuously made available through free on-line updates. The system has been designed with agriculture and farm life in mind, but has applications even in the industry and on construction sites. The touch display with clear icons makes the system easy to operate A carrying handle and quick mount brackets make the devices easily movable to where they are needed.